-'The Hallucinations' would be a place that is somehow not real, not grabable, but it has to have a reason why you are there and how you ended up on it. -If it is 'Zone 1' of the game, then it might be some kind of introduction area, intro, learn-to-play place, what the game is about, etc. -and also some kind of fog in blight green, grey, or blight purple or other blight colours as screen overlay effect. So I thought about places, where all above named could appear naturally but on the other side by the blight fog effect and the too calm music making things weird and give it an unreal impression. 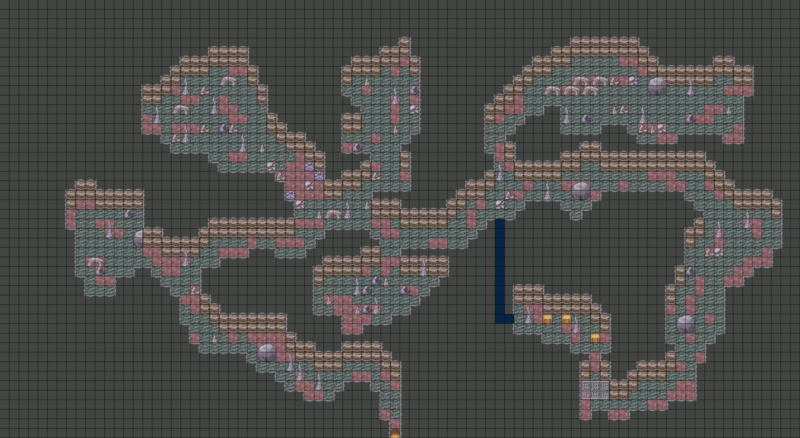 Then I realized some ideas by using the good ol' RPG Maker to chip some ideas together to visuallize what I mean. The fog in a cave can be easily explained by some kind of gas puring out anywhere that causes the player to see funny things that he can fight against. By crating that I could not resist to add a locked room in the end of the one-way-cave which has some interesting loot inside but can't be reached by using the obvious way. Instead there is a hidden path which is on the screen easily seen in the dark-blue colour. This path should be changed to completely invisibility without any hint of noticing it, so players have to search and solve this riddle in order to aquire what lies ahead. The fog in a forest can be easily explained by all kind of plants and the fact that in a shady forest the water can't vapourize as easily as in an open field. Also certain plants like mushrooms give away spores that would be also an explanation why you suddenly see some funny things whose will attack you. I started creating the map with the silvan glade on the rise in the north-west of the forest map as starting point (where you start or end up for whatever reason you have to end up in the first place). After placing the silvan glade I thought about making a simple maze out of trees but I thought that this would be too trivial and thought about a way to seperate THIS forest from other ones. So I created that rise that divide the upper part from the forest from the lower part (and effectively killed the maze-idea). By having a rise already I added that river with a waterfall as second thing since I love waterfalls - you know, smbolizes secrets, tranquilly, water and watching a waterfall for a too long time can also make you losing yourselfe in thoughs, which is exactly what this forest should be in first place. 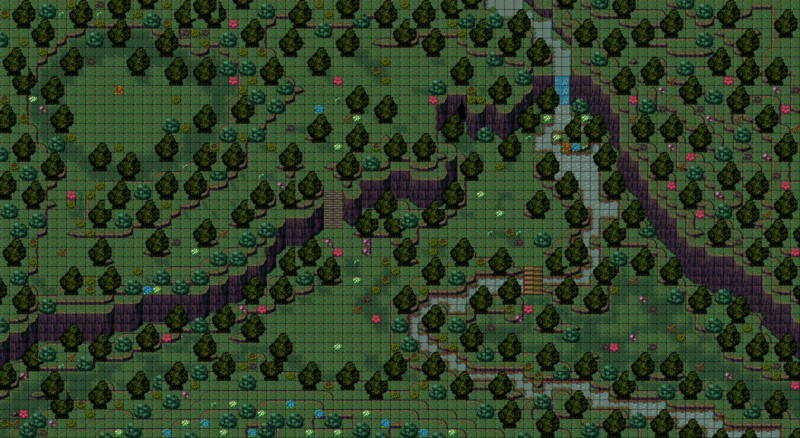 Then I added the path and made sure that there are more glades where you can fight monsters. In the end I added the vegetation and thought about that the area around the waterfall should have more flowers while the south-east should be kinda 'darker' with more mushrooms and should have a wetter gras. And finally I added a crack in the rise to function as a cave entrance. Still having the first version of 'The Hallucinations' in mind I kinda felt like having to add a crack behind that tree near the glade aside the waterfall. After screenshotting the forest I did not over-work the trees and bushes that get overlapped by other objects in the same layer since I already know that it gets created differently in RM and the creator used in OL and it would be too much of a work after already spending over 3 hours in that forest. -4 silvian glades functioning as places where you have enough space to fight imaginary monsters, forest spirits and anything else that does not really exist. -One silvian glade on the rise to function as a special place of some kind. -3 exits: One to the south-east, one to the south-west and the crack in the rise. -A small lake on the foot of the waterfall where you may fish, if this will exist in the game. Well, if I had created it, I would have added a screenshot here, but I didn't. Why? Well, the cave took me 30 mins to create, the forest took me over 3 hours to create and actually I want to post it already and have other things I want to do, too. Edit: well meanwhile I am, editing this included, at 8 hours. The abstract world would be partically something common but easily gets into something very weird - like a normal piece of land and after walking a few metres you notice that you are flying in the sky or whatever. Flying objects amplify this effect like little flying floor tiles you can jump from one to another to reach the next bigger flying land part or flying torches and other things that usually can't float. Aside that certain objects that do not fit would actually fit perfectly in such a world like a giant chair sudenly blocking the path or a soup bowl aside a blue tree with a pyjama shop on its top. The coulors of this map would be generally bright - even so bright that even normal floor tiles do not look natural anymore. After drinking too much alcohol, not getting healed for a certain time after gotten inflicted by a special enemy poision or eating a 'funny looking mushroom' you will end up in 'The Hallucinations'. The purpose is to get out of the state your body ended up in and 'heal' your status away by beating 'The Hallucination'. Remember that you are not really physically dead but that each damage your mind takes will also harm your body - or in other words: if you die in 'The Hallucinations' you will die for real in the game. Gained items will be lost by leaving 'The Hallucination' since these have never been real. Maybe they can be added back by re-joining that zone. On the other side, gained experience and skills could be kept since these are mental things. However, lost items will be dropped in 'The Hallucinations' (for the case if the death-system works similar to BS) and stay there. The reason? Simple: you have no idea where your body was really walking while travelling in 'The Hallucinations'. So let us just say 'the lost items are there where you can't find them in the real world, because you would never imagine it that you actually walked there after waking up'. Well, but you can still re-enter this zone in order to get the items back (like I said, if death will work similar to BS here). @Countpain said clearly, that this would be Zone 1. Well, why not making it 'Zone 1'? But how to connect an unreal, kinda non-existing thing to an introduction? Well by thinking twice it makes even more sense than a zone where you really encounter real beeings - 'The Hallucinations, Zone1' would work as a 'learn-to-play' that NPCs outside of this Zone would normally not teach you, e.g. by explaining an experienced warrior how to use a sword. So this first Zone, the introduction could be actually a dream in which something (or maybe yourselfe by holding monologues) tells you how the game work, how to use a weapon, how to walk, attack etc. Since this is a dream it also explains why suddenly elements like 'The Void Gate' or 'The Onyx Legion' appear in front of you without the need that you ever had to be there. If you die there, you will simply end up at the starting point of this Zone. Maybe there should be one death encounter for purpose with a far too strong enemy which will disappear once your deathount is 1 or higher. So players will know what they will face to when they die for real. In the end of this zone, you wake up. To clearify why you did not keep something like your 'imaginary sword of illusion' the character could make a joke about how 'hillarious this dream was' or that he 'can't believe that he dreamed about wielding a weapon that is not even made of a material that can harm anything'. Well, I already made that statement before, but I personally dislike that this special place 'The Hallucinations' will become a prison players will hate; well but since it is still an original idea and might end up in other creative parts, I am going to point out how it could work. When players have been naughty, nobody likes to get muted or completely banned from the server, so why not adding an own map for these naughty people in which they can still walk around, chat or not chat with other naughty people and do all the naughty stuff they want - or simply kill hallucinatious things that give totally no reward but kill the time untill they can get out of this place. Chatting, if possible, is restricted to the bannished zones only, so if someone spammed the world chat, and is bannished, then he can not contoinue his deed in this zone. Personal messages will not work neither for the same reason. Death has no effect in the bannished zone. You simply return to a starting place - on the other side you will not gain anything in that zone, too. This Zone could be either just a prison-like place where naughty players have to sit till their time is over or it could be a maze-like map (or maps) in whose the naughty players have to find the exit to be able to play again after e.g. spamming the chat too much. I greatly appreciate the time you've put into this. These maps and descriptions are a fun idea to toss around. The beginning storyboard was originally intended to branch off in several ways. I think that it's possible that some of your ideas might hit close to some of ours. Please make sure that you copy this post into the new forum we're transferring to. I'd like to explore some of your ideas when we're ready to do so. Great job on these! @Countpain wrote: Please make sure that you copy this post into the new forum we're transferring to. No worries, after I once lost a 2h work of a bug list forum post, I got always savings of big topics on the local PC before even posting them - and a 8h efford topic is definitelly something that is worth getting saved. @Countpain wrote: I greatly appreciate the time you've put into this. These maps and descriptions are a fun idea to toss around. The beginning storyboard was originally intended to branch off in several ways. I think that it's possible that some of your ideas might hit close to some of ours. Ah.. wut? So after all this 'Hallucination'/Dream/Flashback thingy was actually no joke? I thought it was completelly out of your mind and was nothing but a joke, hahaha, I did not expect that it already had a solid ground. @Countpain wrote: I'd like to explore some of your ideas when we're ready to do so. Great job on these! Aside that... is stuff like that needed/welcomed/helpful? I have full lore in place and a concept of the first questing range. We are keeping all possibilities open however. The most important decision we can make at present is how to open Onyx to the player. With that in mind, we have already set up many scenarios to do so. Although your "joke" scenario seems tongue-in-cheek, we've proposed a somewhat similar idea in a dream.